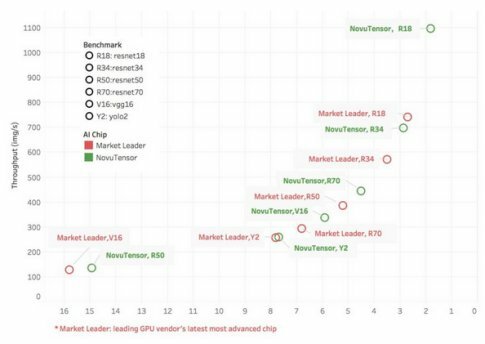 Santa Clara, CA, USA -- October 25, 2018 – NovuMind Inc., a leading innovator in full-stack Artificial Intelligence technologies, today released performance details of its NovuTensor AI chip, with class-leading power efficiency. NovuTensor, purpose-built for deep neural network inference computations, will expand the frontiers of AI by enabling mass deployment of AI inference models at the edge of the network. 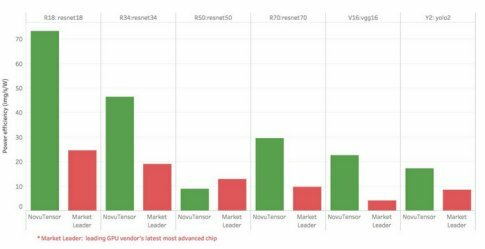 NovuMind has produced its first silicon chips and is releasing benchmark test results showing performance superior to the most advanced GPUs currently available for AI inference applications. The benchmark tests were run with a variety of networks including ResNet18, ResNet34, ResNet50, ResNet70, VGG16, and Yolo2. NovuTensor performance is achieved by a patented design that natively performs 3-dimensional tensor computations on chip, avoiding the overhead inherent in other chips which require tensors to be unfolded into 2-dimensional matrices. This fundamentally new approach, covered by US Patent No. 10,073,816, is optimized for convolution-based deep neural networks. NovuMind will soon be announcing a family of products based on NovuTensor. Initial products will include PCI Express AI accelerator cards and a Developers Kit. Fill out this form for contacting a NovuMind Inc. representative.